Who doesn’t love a great Star Wars novelty item? I have a few including my Star Wars Lego video game for the XBox. In fact, the entire Star Wars Lego series always cracks me up. I always rather enjoyed my Darth Vader head candy container. Darth Tater is a classic among classics. Enter now another Star Wars novelty classic: mimobot Darth Vader. He’s a usb flash drive. You can pre-order yours now. However, they’re not cheap. $80 for 1GB, $120 for 2GB, $170 for 4GB. 80 bucks? No thanks. Why not offer 128MB for say $25? oh well. 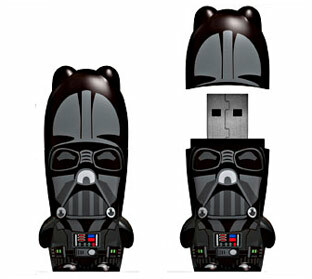 The cost to have Darth Vader be the carrier for your data is extreme indeed. I’d imagine Storm Troppers should offer a much better deal than the enforcer of the Galactic Empire. i wouldn’t trust Jar Jar Binks to carry any of my data.